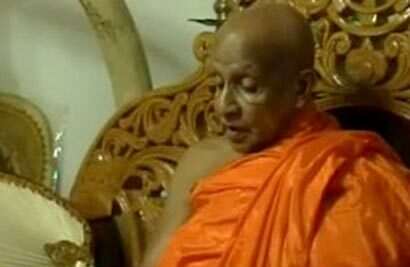 Asgiriya Chapter Maha Nayake Thera the Venerable Udugama Sri Buddharakkita Thera yesterday underlined the statement made by the Mahanayake Theras against the impeachment motion on the Chief Justice. He said if there was a law in the country it should be applied equally to all. Speaking to US ambassador Michele J. Sison who paid a courtesy call on the Prelate, he said some people in the country were accusing others when they could not fulfill their personal agendas. “There should be an opportunity for those who act in a fair and just manner to carry out their duties without let or hindrance,” he said. Ms Sison visited the historic Dalada Maligawa and paid homage to the Tooth Relic before her courtesy call on the Mahanayake Thera. The Mahanayaka Thera said they had issued the statement to the effect that all were equal before the law of the land, but it had become apparent now that some were using it for their own agendas. He said when politicians find it difficult to achieve their personal agendas they try to bring disrepute to those who abide by the law. “It is not fair and therefore we issued a joint statement as the Mahanayaka Theras of the Three Nikayas. We observed that some were bent on creating a situation to embarrass those who uphold the laws of the country,” the Mahanayke Thera said. He commended the assistance rendered to Sri Lanka by the US government and extended his blessings and good wishes to President Barack Obama who had been re-elected for a second term. “The US government has helped our country in the past and does so in the present. We hope it will continue it in the future as well,” he said. The ambassador responded by saying the US helped Sri Lanka during the tsunami and there exists a cordial relationship between the two countries. She said the US for its part would continue maintaining the good relationship and added that she appreciated the sentiments expressed by the Mahanayaka Thera. Ms. Sison also met the Diyawadana Nilame Nilanga Pradeep Dela at the precincts of the Dalada Maligawa. With respect, surely The Mahanayke Theros of the 3 Nikayas should not dabble in politics but devote themselves to the propagation of Buddhism, especially in SL, where Buddhist spiritual values are being forgotten/eroded. They should be focused in encouraging all Prelates of Buddhist temples in SL to encourage a revival of the Buddhist faithful leading a holy life on Buddhist principles as Taught by holy Buddha. I am rather sad that Mahanayake Theros fell victim to the trickery of US ambassdor, to denounce the impeachment motion against chief justice. He said ‘No one is above the law’ but went on to denounce the impeachment motion indirectly. The hearing is before the PSC. Let the law take its own course. Why try to question it? He had an excellent chance to denounce US government for its war crimes in Vietnam, Iraq, Afghanistan and human rights abuse within USA itself by the govt. and its extra judicial killings and assassination around the world by CIA of people who stand up fearlessly against US evils. But he failed to do so. As a spiritual man he should uphold the truth boldly. Well said, Nicholas Dias, youre correct. Has the Pope denounced the slaughtering of Palestinians by the Israelis. The Mahanayke must remember, we poor Sri Lankans have no choice, just say YES SIR! to the West. If there is a law in the UN, it should apply for all and not only for poor countries. You two are not correct jayaraj and Nicholas. Through out our history Buddhists months advised for good governance called ten (10) principles of governance called ‘Dasa raja darma’. If the Mahanayke Theros of the 3 Nikayas are not suitable for advising leaders of the country, who else should do it ? They mentioned their opinion before US ambassador visit them. The chief priests of other religions are also expected to mentions there options at the times of our country in crisis. This is ridiculous and absurd.The American lady soliciting views on the impeachment and excessive borrowings,from the Prelates of the three nikayas, With high reverence and deep respect,I fail to understand why the three respected high priests issue statements which later they seek to clarify.I most humbly refer them to ‘Dhammapada’ -Bala Vagga – Verse 8 – English translation (Narada) of which goes as ‘that deed is not well done when,after having done it, one repents….. I suggest that the good lady should seek opinion of the ‘Vanniyala aththo’ the Veddha Chief as well.After all he represent the oldest tribe in Sri Lanka. Americans are trying hard to gain the lost ground in Sri lanka. Now US staff are going around the country from North to South almost daily, smiling from one ear to the other trying to pretend that US is the savior and the best friend of the island. Unfortunately some fools still fall to this trap and the Mahanayakas appear to be no different. As a Buddhist myself I am appalled to learn that these monks make decisions without any idea what is going on. Parliament is the highest institute in Sri Lanka, not the supreme court. Supreme court is just discharging their duties just like any other department and they all are under the parliament. Like or not that is the democracy we live in. That is why I believe democracy as US is promoting is not the best or the perfect system, while it is not the worst either. However if we chose that system then we have to obey that system. There is no other mechanism other than parliamentary select committee to investigate Chief Justice in case if there is a complaint against the chief justice. That is what is happening today. Parliament is the highest court even above the supreme court, but they do not hear day-to-day cases since it has other things to do, unless special circumstances arise like this one. Parliament makes laws for the judiciary to discharge. Judiciary do not make laws. Judiciary is under the parliament which was elected by people. The 3 Mahanayaka theros appear to have been mislead or got confused how Sri Lankan constitution works. If you don’t know the best thing is to keep quiet. doesn’t mean you are a judge. unhurriedly, in line with the Dhamma.